To view the Museum's holdings of motive power and equipment artifacts, click below on an area of interest. Please note that additional information is available about some artifacts and where applicable hyperlinks appear in the list. Not all large artifacts are included in this list. Northern Pacific Railway #924 Rogers 1899 0-6-0, a King County and City of Snoqualmie Landmark. This switching locomotive was built in 1899 by the Rogers Locomotive Works for the St. Paul & Duluth Railway as their #74. After the railway was taken over by the Northern Pacific Railway in 1900, the locomotive became #924 and was used in general switching of freight and passenger cars. Retired in 1925, the engine was sold to the Inland Empire Paper Co. of Millwood, Washington and was used to switch at their paper mill. In 1969 the Inland Empire Paper Co. donated the engine to the museum. Sole surviving class L-5 0-6-0. Canadian Collieries (Dunsmuir) Ltd. #14 Baldwin 1898 4-6-0. Last operated 1960; Purchased 1960 from CC(D)Ltd.
Canadian Collieries (Dunsmuir) Ltd. #17 Baldwin 1891 2-6-0T+T.&nbsp;Ex-Wellington Colliery Ry. 0-6-0T #17. Purchased 1960 from CC(D)Ltd.
S.A. Agnew Lumber Company #1 Lima 1904 3-Truck Shay. This 3-truck Shay locomotive was build by the Lima Locomotive Works in 1904 for the Newhouse Mines and Smelter Co. for service in Utah. There it hauled copper ore from the Cactus Mine on the Newhouse, Copper Gulch & Sevier Lake Railroad. When the mine played out after ten years, the locomotive was sold, first to Cramer Kay Machinery Co. of Salt Lake City, then to the Eastern Railway & Lumber Co. in Centralia, Washington for the hauling of logs. In 1942 the name was changed to the S. A. Agnew Lumber Co. where it continued to haul logs until the railway was abandoned in 1951. Last operated 1951. In 1964 it was gifted to the museum by the S. A. Agnew Lumber Co. The Shay was stored at a sawmill until it was donated and moved to the Northwest Railway Museum in 1969. Second oldest surviving 3-Truck Shay. Ohio Match Company #4 Heisler 1923 2-Truck Heisler. This geared-type locomotive was built by the Heisler Locomotive Co. as Ohio Match Co. #4, for Ohio Match’s logging operations near Hayden Lake, Idaho. Known as the Burnt Cabin Railroad, this 25-mile long logging railroad ran eastward from Garwood, past the north end of Hayden Lake, ending at the Burnt Cabin drainage. The engine was later sold to the National Pole and Treating Co. (NPT) for their lumber treating plant near Spokane and became the #2. NPT’s name was later changed to Minnesota & Ontario Paper Company (1940). Last operated in 1958. In 1967 the locomotive was purchased by the Northwest Railway Museum from Charles G. Morrow. Union Pacific Railroad (Oregon Short Line) #529 Baldwin 1903 2-8-0. Retired 1965; 1965 gift of Edward Hines Lumber Co.
United States Plywood Corporation #11 Baldwin 1926 2-6-6-2. Ex-Ostrander Railway & Timber Co. 2-6-6-2T #7. Leased 1972 from Washington State Parks. Last operated 1990 at Northwest Railway Museum. Restoration to appearance in 1956 completed in February 2005. Click here to view the results of this restoration. Weyerhaeuser Timber Company #6 Baldwin 1928 2-6-6-2. Built by the Baldwin Locomotive Works in 1928, this engine first served as engine #8 for the Mud Bay Logging Company, first near Olympia, Washington and later at Klamath Falls, Oregon, where it was the Weyerhaeuser Timber Co. #6 (1941-1962). After its retirement, the engine was placed on display in Klamath Falls before coming to the Northwest Railway Museum. Gifted in 1965 by Weyerhaeuser Timber Co. Last operated 1974 at Northwest Railway Museum. Steam locomotive #7 was built in November 1918 by the H.K. Porter Company in Pittsburgh, Pennsylvania as builder’s number 6361. Initially owned by the US Navy, it operated in Norfolk, Virginia, and later in Bremerton, Washington. In 1952 the #7 was purchased by the Olympic Portland Cement Company for use at the cement plant in Bellingham. In June 1956 that operation was purchased by the Permanente Cement Company who in July 1960 donated the locomotive to the City of Bellingham. Bellingham placed the locomotive on a plinth in the Bloedel Donovan Park at the north end of Lake Whatcom where it has remained on exhibit until 2017. Changing priorities for Bellingham Parks resulting in the 7’s donation (technically, purchased for $1) to the Northwest Railway Museum. Snoqualmie Valley Railroad #4012 B-L-H 1954 RS-4TC. Ex-U.S. Army #4012. Purchased 2001 from General Services Administration. In service on the interpretive railway. Snoqualmie Valley Railroad #4024 B-L-H 1954 RS-4TC. Ex-U.S. Army #4024. Purchased 2001 from General Services Administration. In service on the interpretive railway. Weyerhaeuser Timber Company #1 Fairbanks-Morse 1951 H-12-44. Purchased 1987 from Northern Rail Services. Restored to 1950’s appearance; operable. On exhibit in Train Shed. Kennecott Copper Corporation #201 Alco 1951 RSD-4 A. Gift 1983 of Kennecott Copper Corp. Partially restored to 1950s appearance; operable. Sole surviving RSD-4. J. H. Baxter Company #6-C Whitcomb 1925 MO 12 Ton Gasoline-Mechanical. Originally 36” gauge. Purchased 1981 from J. H. Baxter Co. Restored in 2000. Northern Pacific Railway #125 Alco 1940 HH660. Purchased 2001 from Port of Longview; not yet on site. Oldest surviving NP diesel. St. Regis Paper Company #463 Plymouth 1943 ML-6 30 Ton Gasoline Mechanical. Gift 1977 of St. Regis Paper Co.
United States Navy #7320 General Electric 1941 45 Ton. Leased 1976 from Washington State Parks. Last operated 1994 at Northwest Railway Museum. Cecil the Diesel Club mascot. A King County and City of Snoqualmie Landmark, Chapel Car 5 is also on the National Register of Historic Places under the National Criteria. Built in 1898 for the American Baptist Publication Society, described as the brightest, biggest and lightest of the cars, the Messenger of Peace was destined for a long life of service to the church. Constructed by Barney and Smith in their Dayton, Ohio works, the car was furnished with an oak interior and was austere when compared to other cars of the day, although this conservative appearance was not untypical for the Baptists. The Messenger of Peace was nicknamed “The Ladies Car” because it was funded with donations from 75 Baptist women who each contributed $100 towards The Barney and Smith Car Company’s $7,500 purchase price. The car had a colorful and varied service life carrying the church’s word to at least 11 states including West Virginia, Pennsylvania, Colorado, Missouri, Kansas, Iowa, Idaho, Montana, California, Oregon, and Washington. Car 5 was a feature exhibit at the Louisianna Purchase World Exposition in St Louis from April 30 - December 1, 1904. The Messenger of Peace was notable for its many years of service in Washington State. In King County alone, the car visited dozens of communities. The Messenger of Peace continued to serve the church until 1948 and was the last of the American Baptist chapel cars to be retired. It had a significant impact on the lives of people throughout the Northwest and visited towns and villages in nearly every county in Washington. For more information visit www.MessengerOfPeace.org. Canadian Pacific Railway #25 Saskatchewan QMO&O shops 1881 Business Car. 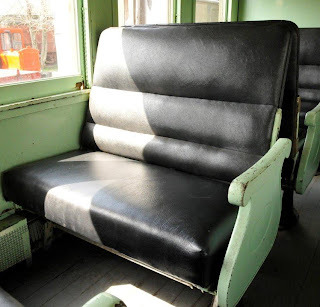 Ex-Quebec, Montreal, Ottawa & Occidental Railway parlor/sleeper Chapleau. Gift 1986 of Cole & Martin. Great Northern Railway #485 Pullman 1921 Baggage. Ex-Pullman sleeper Epicurus. Purchased 1986 from Burlington Northern. Serviceable. Northern Pacific Railway #889 Ohio Falls Car Co 1881 Chair Car. Possibly used on first NP transcontinental train. Purchased 1960 from NP. Northern Pacific Railway #1361 Pullman 1915 Deluxe Coach. Ex-NP smoker coach #1151. Purchased 1989 from Hively. Parlor car 1799 was built by Pullman in 1901 for the Northern Pacific Railway. It served that railway for almost 40 years - including service from Seattle's King Street Station - until it was retired and subsequently purchased by a railroad executive and moved to Whidbey Island for use as a seaside cottage in 1941. In 2018 it was donated to the Northwest Railway Museum and moved from Whidbey Island. Interurban 523 is a King County and City of Snoqualmie Landmark. Built by St. Louis Car in 1907 and put into service in 1908. More than a dozen South King County communities were once served by the PSER and car 523. Car 523 is the only known surviving car, and originally served as a combination coach/parlor/observation car. In September 2017, interurban 523 moved from where it had been stored for 20 years in Petaluma, California to the Northwest Railway Museum. Spokane, Portland & Seattle Railway #52 Barney & Smith 1915 Mail Storage Ex-SP&S mail & express #40. Purchased 1986 from Standard Rail Services. Spokane, Portland & Seattle Railway #213 Barney & Smith 1912 Coach. Purchased 1977 from a private owner. Restoration to 1912 appearance in progress; serviceable. Spokane, Portland & Seattle Railway #218 Barney & Smith 1912 Coach. Purchased 1983 from Burlington Northern. Restoration to 1912 appearance in progress; substantially completed in 2014; serviceable. Spokane, Portland & Seattle Railway #272 Barney & Smith 1915 Baggage-Coach. Ex-SP&S coach #272. Purchased 1977 from Burlington Northern. Serviceable. Spokane, Portland & Seattle Railway #275 Barney & Smith 1915 Coach. Purchased 1973 from a private owner. Spokane, Portland & Seattle Railway #276 Barney & Smith 1915 Coach. Purchased 1972 from Burlington Northern. Serviceable. To view images of interior restoration work, click here. Spokane, Portland & Seattle Railway #556 Barney & Smith 1912 Observation. Purchased 1983 from Burlington Northern. Spokane, Portland & Seattle Railway #701 Wapinitia Pass Pullman 1950 6-5-2 Sleeper. Used on Great Northern Empire Builder. Purchased 1983 from Burlington Northern. Union Pacific Railroad (Oregon-Washington Railroad & Navigation) #1590 Pullman 1913 Café/Observation Car. Ex-UP (OWR&N) Observation #552. Gift 1977 of UP. Restoration to 1932 appearance in progress; serviceable. United States Army #USA-89601 St. Louis Car Co. 1952 Ambulance Kitchen Car. Gift 1987 of Kennecott Minerals Co. Serviceable. Chicago, Milwaukee, St. Paul & Pacific #MILW-33845 CMStP&P shops 1940 Boxcar. Gift 1981 of Robert B. Ledingham. Fruit Growers Express #FGEX-16134 FGEx shops 1920’s Refrigerator Car Purchased 19?? from Rainier Cold Storage. General American #GATX-585 General American 1929 Tank Car. Gift 1980 of Bethlehem Steel Company. Great Northern Railway #GN-43940 Pullman/GN shops 1929 Automobile Boxcar. Gift 1984 of Longview Fibre Co.
Great Northern Railway #GN-43948 Pullman/GN shops 1929 Automobile Boxcar. Gift 1984 of Longview Fiber Co. This former Great Northern wood-framed caboose was built in 1892, rebuilt in 1909, and retired in 1935. It was acquired by retiring conductor Ed Shields of Great Falls until then 1970s. It then was owned by Mr. Jack Hoover of Belt, Montana (near Great Falls) from the early 1970s until his passing earlier in 2010, when his daughter Christina Hoover Blackwell donated this valuable historical artifact to the Northwest Railway Museum. Northern Pacific Railway #1203 NP shops 1909 Cupola Caboose. Gift 1959 of Shelton Chamber of Commerce. Northern Pacific Railway #NP-10896 U.S. Car & Foundry 1923 Boxcar. U.S. Car and Foundry built this double-sheathed wood boxcar in September 1923 as Northern Pacific NP 10896 under Authorization for Expenditure AFE 5018-23. Constructed of double sheathed wood sides, the car has pressed steel ends, wooden side doors, and a Murphy-type arch roof. After its revenue service duties were over, the car was placed into maintenance of way service in October 1960 under AFE 5228-60. It was renumbered NP 200328, which it remained even after the creation of Burlington Northern in March 1970. The Northwest Railway Museum purchased the car. Northern Pacific Railway #NP-14794 NP shops 1932 Boxcar. Purchased 19?? from Burlington Northern. Northern Pacific Railway #NP-14831 NP shops 1932 Boxcar. Purchased 19?? from Burlington Northern. Northern Pacific Railway #NP-28129 Pullman 1944 Boxcar. Purchased 19?? from Burlington Northern. Northern Pacific Railway #NP-28417 Pullman 1944 Boxcar. Purchased 19?? from Burlington Northern. Northern Pacific Railway #NP-83296 Ryan Car Co. 1930 Stock Car. Purchased 1982 from Burlington Northern; Restored 1983 to 1930 appearance. This 40-foot wood stock car was built by the Ryan Car Co in 1930 for the Northern Pacific Railway. This car has two decks which were used to transport smaller animals such as pigs and sheep. Located in most areas in earlier days were loading chutes where the animals could be loaded and moved to market. With the development of larger trucks the stockcar disappeared from the railroads. Northern Pacific Railway #NP-86786 American Car & Foundry 1927 Hart Convertible Gondola. Purchased 1984 from Burlington Northern. Northern Pacific Railway #NP-91366 Pacific Car & Foundry 1949 Refrigerator Car. Purchased 1984 from Burlington Northern. Pacific Coast Railway #PC-9041 Unknown 1918 Steel Drop Bottom Gondola. Gift 1986 of Rayonier Inc. Shell Chemical Company #SNHX-2058 General American 1943 Tank Car. Gift 19?? of Shell Chemical Co. Shell Oil Company #SCCX-1246 General American 1929 Tank Car. Gift 1971 of Shell Oil Co. Built as SCCX 1246 for Shell Oil Co. by General American Tank Car at Sharon, Pennsylvania, in November 1929, the car was assigned to service out of Martinez, California. Designed to transport heavy petroleum products such as bunker oil, the car is insulated and equipped with steam heating pipes to aid the transfer during cold weather. After 40 years of service from California to Washington, the car was repainted and refurbished by Shell before being donated to the Northwest Railway Museum in 1971. In 1972 the car was placed into service hauling waste oil for the steam locomotives from Seattle to Snoqualmie and was assigned reporting marks PSHX 1246. Western Fruit Express #WHIX-70325 Pacific Car & Foundry 1953 Refrigerator Car. Donated by Alaska Lumber & Pulp. Pacific Car and Foundry in Renton built this steel ice refrigerator car in 1953 as Western Fruit Express WHIX 70325. The Great Northern operated Western Fruit Express. The car remained in service after the creation of Burlington Northern and kept its original number. Alaska Lumber and Pulp Co. purchased this one for transporting food supplies by barge from Seattle to the sawmill in Sitka, Alaska. It became ALPC 2500. Alaska Lumber and Pulp donated the refrigerator car to the Northwest Railway Museum. Puget Sound Naval Shipyard Flatcar #PSNS-802 Kilbourne-Jacobs 1918 Flatcar. Leased 1976 from Washington State Parks. Puget Sound Naval Shipyard Gondola #PSNS-815 Kilbourne-Jacobs/PSNS 1918 Gondola. Built on PSNS flatcar. Leased 1976 from Washington State Parks. Rayonier Inc. #None Nisqually-Russel Car & Locomotive Works 1916 Plate Type Log Disconnects (5 pairs). 1968 gift of Rayonier. Rayonier Inc. #None Russel Wheel & Foundry 1900’s Model 55 Log Disconnects (Three Pairs) Gift 19?? of Rayonier. Restoration to appearance early in use completed. Click here to visit Martin Nemerever's web site with additional photos and commentary. Rayonier Inc. #None Seattle Car & Foundry 1912 Snohomish Model Log Disconnects (1 Pair). Gift 1968 of Rayonier. Rayonier Inc. #None Seattle Car & Foundry 1915? 4 Cubic Yard Side Dump Cars (Two Cars). Gift 1968 of Rayonier; Restoration to circa 1961 appearance completed. Click here to visit Martin Nemerever's web site with additional photos and commentary. Rayonier Inc. #1 Rayonier shops 1940’s? 1,000 Gallon Fire Car Built on side dump car frame. 1968 gift of Rayonier. Restored to circa 1950 appearance. Click here to visit Martin Nemerever's web site with additional photos and commentary. Rayonier Inc. #21 Fairmont/Rayonier shops 19?? Gang Motor Car. 1984 gift of Rayonier. Rayonier Inc. #35 Gibson Mfg. 1951 65 Man Logging Crew Speeder. 1984 gift of Rayonier. Seaboard Lumber Co. #None Ohio Crane 1929 25 Ton Crane. 1973 gift of Seaboard Lumber Co.
Skagit River Railway #40 Pacific Car & Foundry 1928 4-wheel Trailer. Gift 19?? of Charles G. Morrow estate. Restored 2001 to 1940’s appearance. Click here to visit Martin Nemerever's web site with additional photos and commentary. Skagit River Railway #138 Unknown 1900’s Tank Car Purchased 1967 from Seattle City Light. Skagit River Railway #203 Unknown 1900’s Flatcar 1971 gift of Simpson-Lee Paper. Skagit River Railway #205 Unknown 1900’s Flatcar 1971 gift of Simpson-Lee Paper. White River Lumber Co. #001 WRLCo. shops 1945 Cupola Caboose. 1973 gift of Weyerhaeuser Timber Co. Restoration to 1945 appearance in progress. Click here to visit Martin Nemerever's web site with additional photos and commentary. Chicago, Milwaukee, St. Paul & Pacific #X-908140 CMStP&P shops 1910 Water Tender. Ex-CMStP&P 4-6-2 #849 tender. Gift 1962 of CMStP&P. Northern Pacific Railway #10 Alco 1907 Rotary Snowplow. Gift 1968 of NP. Listed on King County Register of Historical Places. Northern Pacific Railway #41 NP shops 1926 Scale Test Tool Car. Ex-Grand Trunk Railway boxcar #22550, built by Canadian Car and Foundry, circa 1912. 1972 gift of Burlington Northern. Northern Pacific Railway #204860 Unknown 1890’s Bunk Car Ex-NP boxcar #NP-?????. Gift 19?? of NP. Spokane, Portland & Seattle Railway #X-5 Industrial Works 1908 75 Ton Wrecking Crane. Gift 1972 of Purdy Co. Built in 1908 by Industrial Works of Bay City, Michigan, the X-5 is a small wrecking crane designed to lift up to 75 tons. Wrecking cranes were used to clean up after train wrecks, hence the name. The crane would actually lift the locomotive up and place it back onto the track. It was powered by a two-cylinder steam engine and used two lifting cables. The steam was provided by an oil fired vertical boiler and the crane was capable of swinging 360 degrees (but would have to be stabilized in order to work within this arc). A train would need to move the X-5 to the site of a wreck, since the crane was not self-propelled. It was retired once larger cranes became available with the creation of Burlington Northern. Spokane, Portland & Seattle Railway #X-116 Haskell & Barker/GN shops/SP&S shops 1898-1917 Idler Flat. Ex-Great Northern boxcar #4722. Purchased 1975 from Burlington Northern. Boom tender for SP&S #X-5. Bridge 35 Lassig Bridge and Iron Works, 1891-built through-pin-connected Pratt truss. Restored in 2003; purchased 1981 from the Burlington Northern Railroad. This 160-foot long through-pin-connected Pratt truss was constructed in 1891 by Chicago's Lassig Bridge and Iron Works. However it was not built in North Bend - it was the seventh crossing of the Yellowstone River on the mainline of the Northern Pacific Railway in Montana. 1891's heaviest imaginable locomotive was just a few hundred thousand pounds. Just over thirty years later, the largest mainline locomotives were nearly 1.2 million pounds. So when a new, stronger bridge was erected over the Yellowstone in 1923 to support these new super-sized locomotives, the old bridge was dismantled, moved to North Bend, and re-erected over the southfork of the Snoqualmie River on a lighter density line called the Snoqualmie Branch. The structure includes the steel span and 798 feet of ballast deck timber trestle approaches. The timber trestle portion was built in 1929. Bridge 35 received a major rehabilitation in 2003/2004. The Bridge 35 Rehabilitation received the 2005 Washington State Historic Preservation Officer's Valerie Sivinski Award for Outstanding Achievement in Historic Rehabilitation. To view the award, click here. To view the rehabilitation, click here. Bridge 5.46 (demolished May/June 2005) A & P Roberts Company, 1896-built through-pin- connected Pratt truss. Moved to Snoqualmie in 1916. Bridge 5.46 was erected over the Snoqualmie River in 1916. The steel span portion of the structure dated from 1896 and was 180 feet long. It was first used in Wisconsin on the Superior Division of the Northern Pacific Railway where it supported heavy iron ore freights for nearly 20 years. Rising tonnage and larger locomotives required a stronger bridge but in keeping with Northern Pacific practice, and that common on many railroads, the span was dismantled and moved in pieces to Snoqualmie where it was reassembled and used to replace a wooden truss. It saw heavy use supporting trains of logs and finished lumber until shortly after the Northern Pacific Railway merged with other roads to form the Burlington Northern Railroad. From 1975 until 1989, the bridge connected the Northwest Railway Museum with the general system of railroads but in 1990 a portion of the structure - a short plate girder section - was damaged by floodwaters. In 1994 the structure was sold to King County for reuse as a trail. Other priorities intervened and in May and June 2005 it was demolished and scrapped by the Army Corp of Engineers. The span was a through-pin-connected Pratt truss, the predominant style of railway bridge construction in the era from 1890 until 1920 and was designed and built by the A & P Roberts Company (merged into American Bridge Company in 1900). It was nearly identical to the Northwest Railway Museum's Northern Pacific Railway Bridge 35, rehabilitated in 2003/2004. This bridge design revolutionized the railroad allowing greater tonnage and a significant increase in locomotive size over earlier designs. Its modular design also sped fabrication and construction, particularly in remote wilderness areas. The design was itself superseded by even stronger bridge construction to support the continuing increases in train tonnage and locomotive size. For the Northern Pacific Railway, that was the arrival of the Z class and other large motive power pushing total engine and tender weights to 500,000 pounds and beyond.